Jo McDougall brings a poet’s sensibility to memoir. Recounting five generations of Delta rice farmers, through family archives and oral histories, she traces how the clan made their way into the fabric of America, beginning with her Belgian-immigrant grandfather, a pioneer rice farmer on the Arkansas Delta at the turn of the twentieth century. As John Grisham has for a 1950s Arkansas cotton farm, McDougall illuminates an Arkansas rice farm in the 1930s and 1940s. 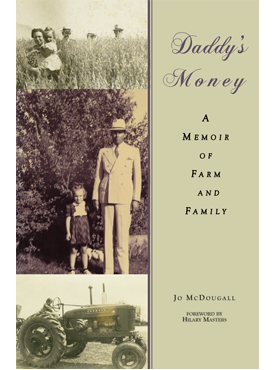 The Garot family’s acreage near DeWitt and the town itself provide the stage for McDougall’s wry, compelling, and layered account of the day-to-day of rice growing on the farm that her father inherited. In that setting she discovers a rich “universe of words” in the Great Depression, comes of age during World War II, and finds her way alongside “that whole quirky, compelling cast of characters” that comprised her kin. In this conflicted, ironic, southern-but-universal account of betrayal, heartbreak, loss, and joy, “the vagaries and the grace” of the land join forces with the power of money as family bonds are both forged and dissolved. Jo McDougall lives in Leawood Kansas. She is the author of five books of poetry, including From Darkening Porches and Towns Facing Railroads. In 2018, McDougall was awarded the the Porter Fund’s Lifetime Achievement Award, given out every five years to an established Arkansas writer. Hilary Masters is the author of Last Stands: Notes from Memory and Post: a Fable.